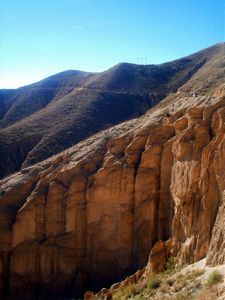 There are no paved roads through the mountainous Bolivian countryside from Tupiza to Uyuni only narrow, dirt paths clinging to the sides of mountains. Land travel here is slow at best and fatal at worst. After it rains, dirt paths turn into muddy slip and slides giving nothing for vehicle tires to grab onto. It’s not all bad news though. 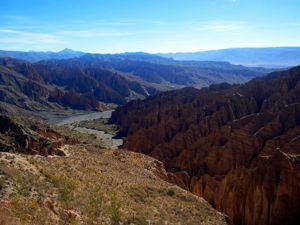 The scenery there is spectacular with needle like rock formations rising up out of the canyon’s depths at 12,000 ft above sea level. 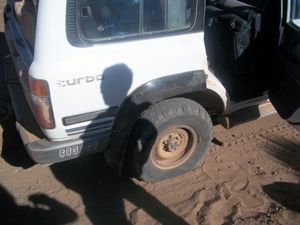 Our jeep got a flat tire within the first 3 hours of driving and as the tour guides changed the tire with the efficiency and speed of a seasoned Indy 500 pit crew, I realize this would not be our first. Our first flat out of many on the trip. For Lunch, we stopped by a herd of llamas. Llamas are silly looking creatures that always bring a smile to my face with their long giraffe like necks and skinny little legs supporting what appears to be fat, but really just hairy, bodies. 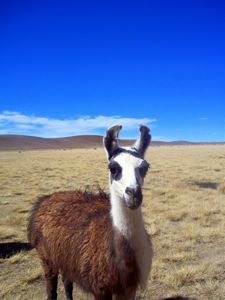 Most of the llamas (pronounced “Yama” in Spanish) kept a safe distance, but the herd’s cannibals hung around for llama filled empanada food scraps. Yuck, Llama eating llama action. The first night we stayed in San Antonio de Lipez, a village with 250 inhabitants, but it felt like a ghost town. The villagers welcomed us by hiding in their houses when any of us walked by. To break the ice, Ben bought some candy to give to the local children at the only store in the village. To me this plan sounded alittle too much like a PBS service announcement on “Stranger Danger”, but it worked, kind of. Eventually the kids warmed up enough to run up and quickly claim the candy from us. Sadly none of them would let us take our picture with them. One of the locals getting ready to hide from us. We bundled up for the night. At 12,000 ft above sea level it was well below freezing and none of buildings in the village had heat. There was a generator that ran from 7 pm to 9 pm giving us light to eat dinner and then it was promptly shut off. 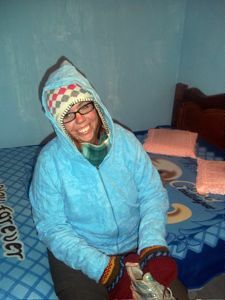 To keep warm I had on leg warmers, thermal underwear, heavy trekking socks, 2 pairs of traveling pants, a t-shirt, a long sleeve shirt, two sweatshirts, gloves, ear muffs, a hat, sleeping bag and two heavy blankets. 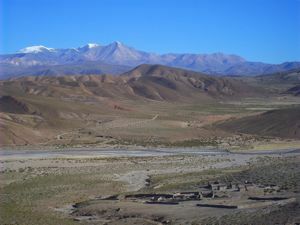 Typical Bolivian village in the Altiplano. The next morning we woke up at 5:30 am. 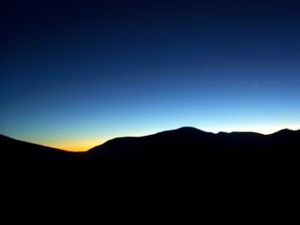 As the sun rose we arrived in the abandoned town of San Antonio. This town was once a very rich gold mining town run by the Spanish. Our guides told us that the Spanish performed human sacrifices here and then later animal sacrifices. It is believed that they worshipped the devil. The Bolivians who mined the gold for the Spanish built a church to try to sanctify the town. After the church was built the devil told the Spanish that they could no longer mine here. 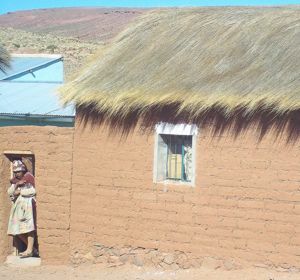 The Bolivians who stayed abandoned the town just 40 years ago because there was too much death among the locals. The guides told us that the town is now hunted and ghosts can be seen walking around at night by moonlight.